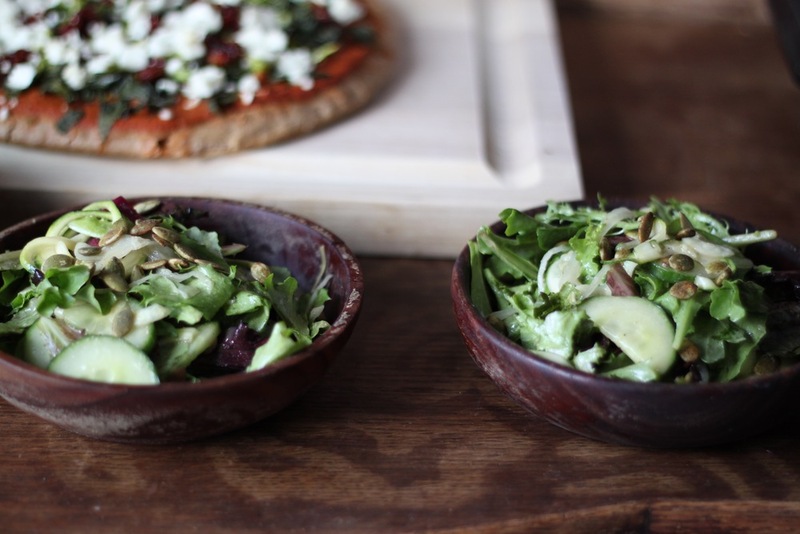 There’s nothing quite like a refreshing leafy green salad for a meal when it’s hot outside. This recipe is filled with antioxidant rich green vegetables, plus the digestive supporting sauerkraut. For those of you who are wary of sauerkraut, this is an easy and tasty way to incorporate the healthy fermented cabbage into your diet. 1. Toss the pumpkin seeds together with other ingredients and spread out on baking sheet. Roast for 5-10 minutes at 350 until lightly crisp (be careful not to burn). 2. Spiralize the zucchini with a spiralizer. 4. Mix together the dressing ingredients until creamy and blended. 5. Toss all of the vegetables together with salad dressing. 6. Top with toasted pumpkin seeds.